As girls around the world prepare to kick off Scouting’s second century, discover what’s new, and what remains the same, in the organization that was founded eight years before U.S. women got the right to vote. Some 3.2 million girls, and millions of alumnae, have begun celebrating the 100th anniversary of the Girl Scouts of the USA (GSUSA) – and it’s an impressive group. About 80 percent of America’s female business owners and executives are Girl Scouts alumnae, as are 58 percent of U.S. Congresswomen and 22 percent of NASA’s career astronauts. These forward-thinking gals aren’t just celebrating 100 years of existence on March 12; they’re also kicking off the next century of Girl Scouting. Megan likes the way Girls Scouts encourages girls to explore new experiences together, from cooking old, ethnic family recipes to designing websites and service projects. She recently flew to Houston, with a delegation of local Scouts, to attend a national-level 100th anniversary bash. There, she met many strong female role models, from scientists and engineers to big-city police chiefs, not to mention celebrities like Project Runway winner Chloe Dao. It wasn’t the first time Scouting had put Megan in the presence of celebrities. A troop leader for nine years, Kalafut also likes the way Scouting helps her daughters to discover and explore their personal interests. Ever since she was in diapers, Elizabeth Kalafut tagged along with her mom and big sister Megan to Girl Scouts meetings, until old enough to join a Daisy troop during kindergarten. “We do super-duper fun crafts and field trips – it’s so fun,” says Elizabeth, a fourth-grader at Isaac Fox Grade School in Lake Zurich. Elizabeth enjoys pursuing animal-related badges, such as the Backyard Chickens badge. “You learn about taking care of an animal, its diet, about being responsible for it,” she explains. “For the horse badge, you learn about parts of a horse and saddle, and about riding. You know, back then, when Juliette Low started all this, girls had to ride sidesaddle because of skirts. Now we can just wear jeans.” Elizabeth also enjoyed a CSI-type activity in which girls blew up a balloons and examined the fingerprints on them. So what does a 100th anniversary mean to one so young? Like the Kalafut sisters, Harleigh Welch, 13, of Woodstock, has been a Girl Scout most of her life. Her mom, Janey Welch, is an assistant troop leader. Harleigh especially enjoyed a recent troop outing to the Northern Illinois University (NIU) STEMfest, where she took part in hands-on Science, Technology, Engineering and Math (STEM) activities led by NIU graduates. Service projects are one of Harleigh’s favorite aspects of Scouting. Her troop recently presented handmade valentines to retirement home residents and helped to prepare meals at a local homeless shelter. Welch says the recently updated curriculum used by today’s Girl Scouts better accommodates busy older girls, and also does more to encourage critical-thinking skills. Harleigh isn’t the only one concerned about misperceptions. The subject was discussed among Girl Scouts leaders at all levels, in preparation for a new century. As a national organization, the Girl Scouts has shored up its structure, revamped its curriculum, updated its lingo and repositioned itself to carry on its mission: Building girls of courage, confidence and character, who make the world a better place. As part of its commitment to remain relevant, GSUSA researches girls, their issues and attitudes, and acts upon its findings. When the problem of negative body image became prevalent, for example, GSUSA worked with the Dove brand to launch the “Campaign for Real Beauty,” in which product ads feature real women, not models. Ads are focused on promoting natural beauty, in an effort to offset unhealthy archetypal images associated with modeling. In 2010, GSUSA tackled the “negative images” issue head-on, with the Healthy Media for Youth Summit and the introduction of the related Healthy Media for Youth Act. The summit drew participation from celebrities and other leaders. Among other things, the legislation gave rise to a competitive grant program to support media literacy programs and establish the National Task Force on Women and Girls in the Media. Likewise, when bullying and cyberbullying became widespread problems, Girl Scouts stepped up to help girls cope in a healthy manner, rather than isolating themselves. Tackling the problems girls face because of their gender or social class is in keeping with vision founder Juliette Gordon Low set for Girl Scouts one century ago. Juliette Gordon was born into a large, privileged family in Savannah, Ga., in 1860, a year before the Civil War began. Her father traded cotton and served as a Confederate officer. Juliette was an avid traveler, artist, athlete and animal lover. At age 26, she married wealthy Englishman William Mackay Low. The couple lived in England, but Low visited Savannah often. Treatments for chronic ear infections had left her nearly deaf in one ear, and removal of a piece of rice tossed during her wedding caused total deafness in the other. Undaunted, she searched for something meaningful to do with her life. Six years after her husband’s death in 1905, Low met Sir Robert Baden-Powell, founder of the Boy Scouts and Girl Guides, and became inspired by his work. She returned to Savannah and, on March 12, 1912, phoned a distant cousin, famously saying, “I’ve got something for the girls of Savannah, and all of America, and all the world, and we’re going to start it tonight!” She invited 18 Savannah girls to her home and registered the first troop of the American Girl Guides. The name changed to Girl Scouts the following year. At age 52, Low had found her meaningful work. There’s no question Low was swimming against the tide of public sentiment. American women didn’t even receive the right to vote for another eight years. Low believed that girls should have the opportunity to develop themselves mentally, physically and spiritually. All the more remarkable is the fact that this daughter of a an Old South plantation ensured that African-American, American Indian and Hispanic girls were welcomed as Girl Scouts. She made sure Girl Scouting was available to girls who lived in rural and urban areas; to girls who were rich, middle class and poor; and to immigrant girls as well as those born in the United States. Today, GSUSA has a membership of more than 3.2 million, and more than 50 million American women are Girl Scout alumnae. 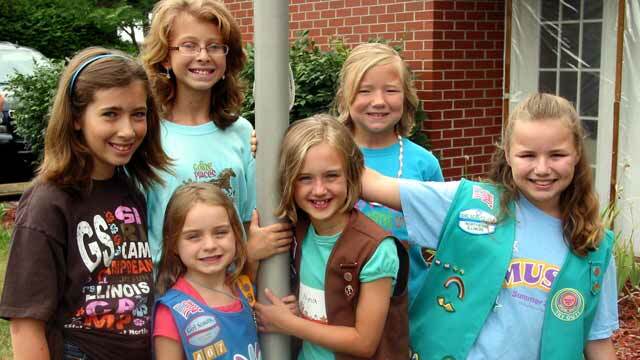 In Illinois, about 136,000 girls, age kindergarten through high school, are Scouts. As the organization prepared for a new century, it made significant changes, including cost-saving consolidation of its council offices. GSUSA serves girls grades K-12, through the Daisy (K-1), Brownie (2-3), Junior (4-5), Cadette (6-8), Senior (9-10) and Ambassador (11-12) program levels. When they’ve completed 12th grade, young women may opt to become lifelong members of Girl Scouts. Along the same lines, while GSUSA still relies heavily upon adult volunteers to lead troops, it has widened opportunities for adults to become involved in smaller time increments. “When I started as a troop leader nine years ago, I had to attend a three-hour training meeting,” says troop leader Mary Kalafut. “Today, there are options to train through webinars, conference calls – all sorts of ways to help you fit it into your life.” There also are important roles for adults who can’t commit to leading troops, from stuffing envelopes to clearing trails at Girl Scouts camps. GSUSA is highly interested in exposing girls to fields traditionally reserved for men, including those that are math, technology and science-related. From its research, the organization knows that many girls drop out of math and science activities by fifth grade. It’s all about keeping the Girl Scouts experience relevant. Girls may earn badges in a wide array of interests, both traditional and modern, or may design their own badge programs in subjects of their choosing. Whereas girls may once have had to write a report on a badge subject, now, with the new Journeys curriculum, they do more in-depth, hands-on activities, explains Kocol. Example: The Savvy Shopper activity is one pathway to earning a Business Badge. It challenges a girl to tour rooms in her house and write down five things in each room that are the most important to her. She make choices – is that 7th pair of blue jeans in the bedroom more important than that lamp she needs for reading? The exercise helps girls to distinguish needs from wants. Each time a girl feels the ‘I want that’ urge, she logs it and tries to identify the trigger that caused it. Then she’s asked to discuss these triggers with family and friends. Girl Scouts at all levels are planning a year of special activities. “We have a nationwide goal of raising $1 billion to transform the philanthropic landscape for women and girls, providing girls around the world with the skills and opportunities to reach their fullest potential,” says Kocol. Recognizing that 5,000 baby girls will be born in the United States on March 12, GSUSA has invited parents to register with the GSUSA website, and to post their daughters’ photos along with aspirations for their lives. With parental permission, GSUSA will track and study these girls year by year. Girl Scouts of Northern Illinois has prepared special baskets for baby girls born in local hospitals on that day. “Girl Scouts – Forever Green” is the national 2012 theme, and councils are undertaking environmentally friendly service projects with lasting significance, such as establishing rain gardens or reducing waste. While no one can say life is perfect for modern-day U.S. women, who face a whirlwind of conflicting ideas about their roles in society, one can say they have more opportunities now than ever before. Skills gained through Girl Scouts are helping many women to seize those opportunities. This entry was posted on Monday, March 19th, 2012 at 11:58 am	and is filed under Features, Top Posts. You can follow any responses to this entry through the RSS 2.0 feed. Both comments and pings are currently closed.